There are two ways to look at the charts from Pew Research which shows the percentage of household heads who rent their home. The first is to say the percentage is going back to historical norms so there’s not much of a reason to worry. 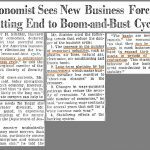 The second is to say the trend is worrisome as it shows little sign of stopping despite the fact that this is the second longest (so far) economic expansion in US history and by that definition is likely nearing a conclusion, not a beginning. The goods news is that of the prior 6 recessions (demonstrated by the gray bars) only two led to any sustainable increase in the renting rate. Clearly, the rates seen in the early 2000s were unsustainable because the housing bubble was at its peak. This recent increase in renting is likely a combination of the change in the way the millennial generation sees housing and the decrease in the ability to afford it. This brings us to the second point which is student loans make it difficult to save for a down payment or qualify for a loan with a good interest rate. The more money you owe in loans, the lower your credit score which increases the interest you need to pay on a mortgage. Affordability is a big factor in why people choose to rent instead of buy. Housing is unaffordable in many major cities in the US because of zoning restrictions. The government sets up restrictions for where single family housing can be built, where multi-family housing can be built, and where no housing is allowed. The more areas not allowing housing and allowing only single family housing, the less total dwellings the city has to offer. 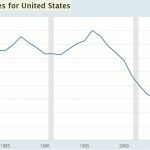 Less housing supply means higher prices. Zoning regulations are meant to keep open the idea of having a white picket fence and a backyard as proposed in the theoretical ‘American dream.’ However, keeping these houses in existence just turns it into an American nightmare because the supply shortage causes prices to soar. It’s easy to tell people to leave the city for affordable housing, but cities are where most jobs are. You can lengthen your commute by living in the suburbs, but it’s a huge burden to be driving hours every day to get to work. 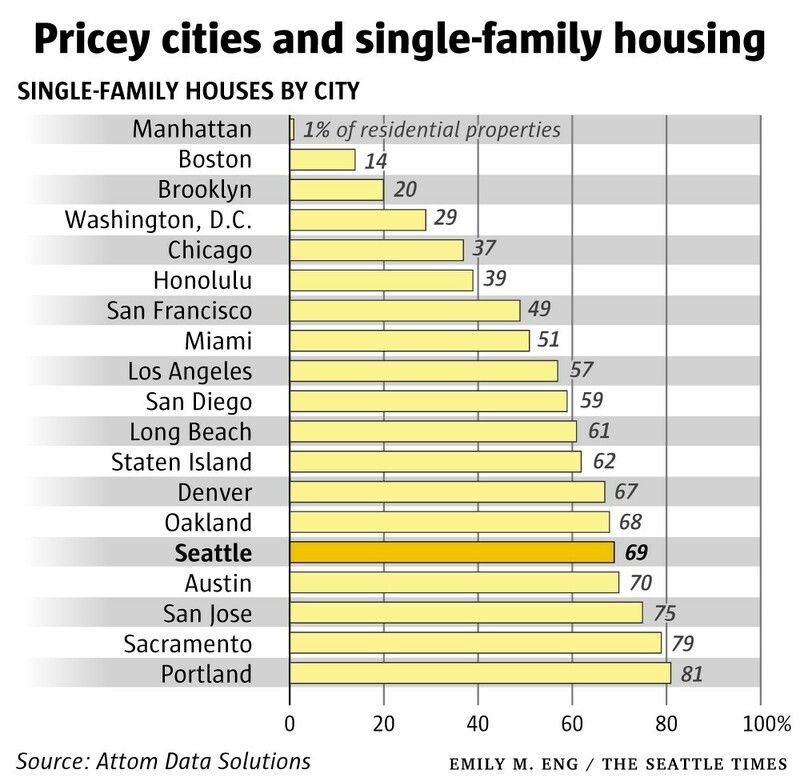 The chart from the Seattle Times shows the percentage of residential land that is dedicated to single family housing in a few cities which have affordability issues. The higher numbers are bad because it means there’s no room for apartment buildings. Apartment buildings may not be ideal for some people, but it’s best to listen to what the market is demanding to make housing more affordable. In Seattle, 18% of residential land accounted for 88% of the city’s housing growth because those are the areas multi-family housing is allowed to be built in. 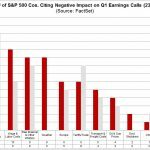 Washington has been absorbing a huge influx of people, more recently, Seattle has been growing even faster because it is the location of Amazon’s headquarter. Amazon has 541,900 employees, many of which are in Seattle. Amazon was founded in 1994, so that’s a lot of hiring in a short period of time. Zoning restrictions make it too expensive to buy a house for many middle class people. In Seattle, the median single family house costs $820,000. This means households must make $140,000 per year to purchase the median home. That’s impossible to afford for most people as the median household income in Seattle in 2016 was $78,612. This housing affordability doesn’t stop with purchasing homes. Renting is more expensive as well as regulations which prevent more apartments from being built. As you can see in the chart from Zillow, big cities such as Los Angeles and San Francisco have over 40% of income being spent on rent. 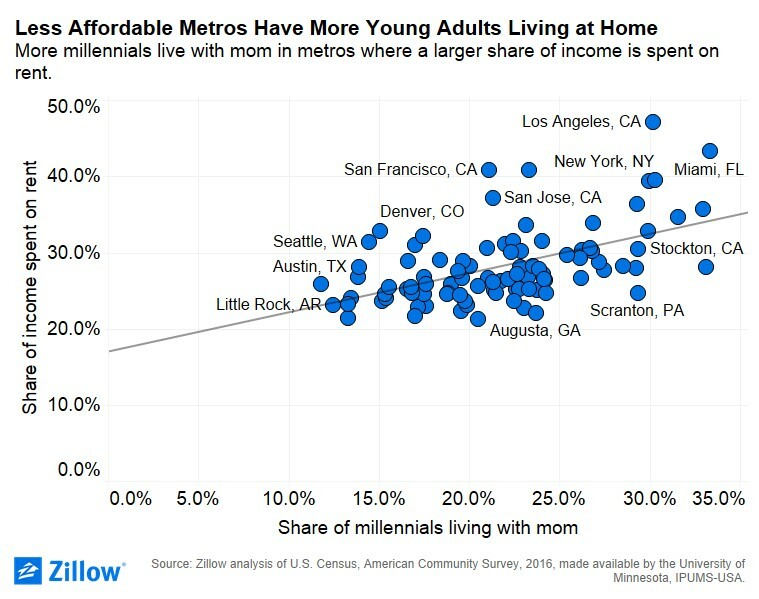 There is a clear correlation between the cost of rent and the share of millennials living with their parents. Cities such as Miami, New York, and Los Angeles have over 30% of 24-36 year olds living with their parents. The share of young people living with their parents in New York City has increased from 20.4% in 2005 to 30.3% in 2016. The share of young people doing so in Los Angeles has increased from 18.4% in 2005 to 30.2% in 2016. With the decline of millennials moving across state lines, it doesn’t appear moving to find more affordable housing is a realistic option. 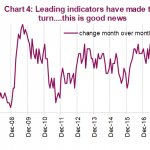 The latest NY Fed household debt and credit report from Q1 2018 brings goods news for housing. Only 1.2% of mortgages are 90+ days delinquent, as you can see in the chart. That’s the lowest delinquency rate since Q3 2006. The home equity line of credit delinquency rate is 1.5% which is also much lower than it has been in the past few years. The only troubling areas in this report were other and auto loans. Other went from 7.6% to 8% and auto went from 4.1% to 4.3%. 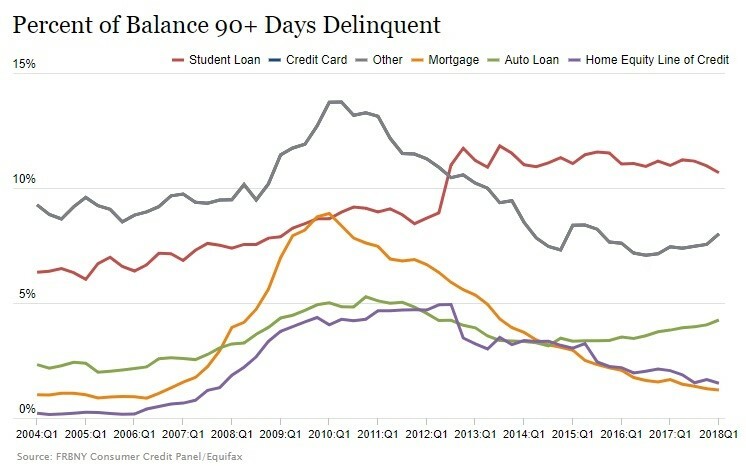 Auto delinquencies are now closer to the most recent peak than the trough in this cycle.